Father Gerald Meier, who is retired and in residence at Holy Spirit Parish in Maryland Heights, talked with Miriam Woodruff before Mass. “He is so funny and personable, but when he is on the altar, he is a holy man. We hope he says here for the rest of his life,” she said. Being with parishioners, particularly after weekend Masses, brings joy to a retired priest serving at Holy Spirit Parish in Maryland Heights. And the parishioners are glad he’s there. Outside the church after a Saturday vigil Mass, Father Gerald Meier greeted and chatted with parishioners, including teenagers Caleb Grothoff and Allison Brown. “I love Father Jerry — he’s a great guy,” said Grothoff, who has known Father Meier since grade school. Also after the Mass on April 6, Father Meier visited with the Brandon and Jane Rothkopf family. They noted that their youngest child, Will, was so wound up they brought him out of church where he occupied himself washing his toy cars in a drinking fountain. With a quick response, Father Meier praised the toddler and told the family that the little guy was symbolically washing sins away. Father Gerald Meier gave the homily at Mass at Holy Spirit Church in Maryland Heights on April 6. Father Meier was ordained in 1966, and has been retired in residince at Holy Spirit Parish since 2016. A second collection held at Masses on Easter benefits priests in retirement, regardless of where they live and whether they remain active in sacramental ministries. Of the 89 retired diocesan priests, 20 are in residence at parishes. 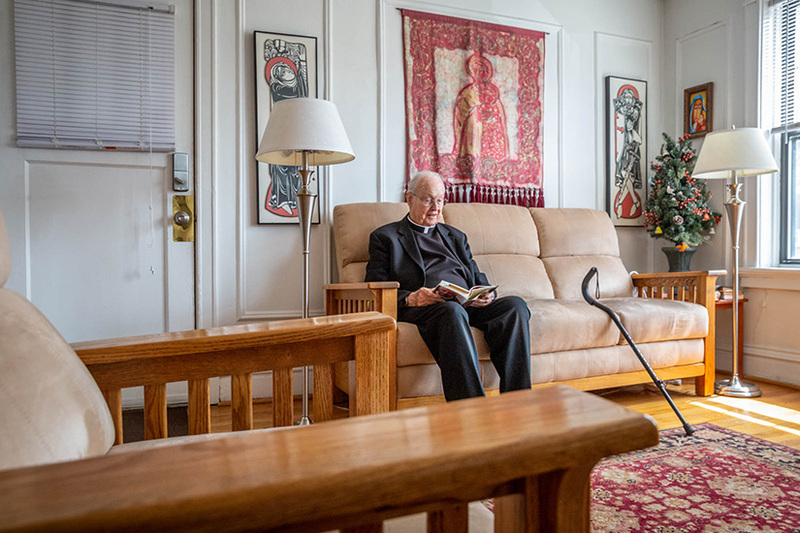 Some of the other retired priests in private residences or at the Regina Cleri residence for retired priests serve as substitutes at parishes, filling what would otherwise be a huge void. 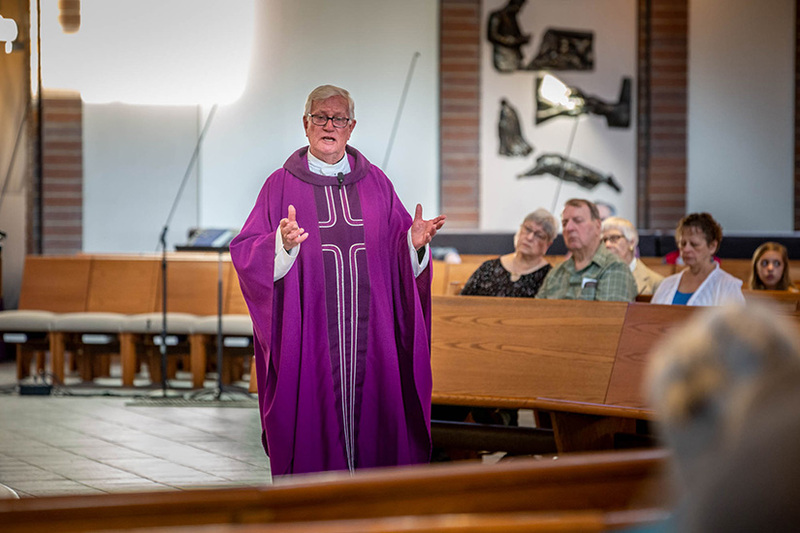 Father Meier celebrates about half of the regular Masses at Holy Spirit Parish, occasional funeral services and a Mass attended by students in the parish school occasionally. He continues to do spiritual direction for individuals, something he’s done for many years. Father Meier, 78, came to Holy Spirit Parish as a senior associate pastor. When it came time to retire in 2016, he wanted to stay in ministry. “It was convenient to stay in the parish, and the people here have been overwhelmingly welcoming. They’re just great people, they’re easy to be with,” he said. Retirement gives him a little more time to enjoy hiking, biking and travel, he said. Msgr. Nicholas Schneider read “Jesus of Nazareth” by Pope Benedict XVI at his apartment in St. Louis on April 8. Msgr. Schneider, who was ordained in 1956, is retired in private residence. Msgr. Nicholas Schneider retired in 2005 to an apartment, which was the best setting for him to write the biographies of two cardinals who led the Archdiocese of St. Louis, Cardinals Joseph E. Ritter and John J. Carberry. He finished the work in 2009. He wrote a book in 1971 on Cardinal John J. Glennon. Besides that work, he also assisted at various parishes by celebrating Masses. Then, for about the last 10 years he has celebrated Mass at the Sisters of the Good Shepherd Convent (the retired sisters now live at Mason Pointe). Until recently he celebrated Mass once a week at the Carmelite nuns’ monastery. Since 1990, he’s been involved with a priest-rabbi dialogue group. The fact that priests who are able stay in active ministry until age 75 “is really a blessing,” he said. Msgr. Schneider noted that the three cardinals that he wrote about had unique contributions to the Church. Cardinal Glennon “was a great builder,” Cardinal Ritter “was a great social justice figure with his integration efforts and battle for religious liberty at the Vatican Council” and Cardinal Carberry “was a blessing to us with his vision to carry through the council,” he said. When Vatican II convened in 1962, then-Father Schneider was assistant pastor at Holy Cross Parish in North St. Louis, under pastor Msgr. Martin Hellriegel, who was influential in the liturgical movement. Working with Msgr. Hellriegel “was a blessing to my priesthood,” said Msgr. Schneider, who was executive secretary of the archdiocese’s liturgy commission for 16 years and chairperson for nine years. Msgr. Schneider also has observed many “great men, dedicated priests and true leaders” in the priesthood, he added.